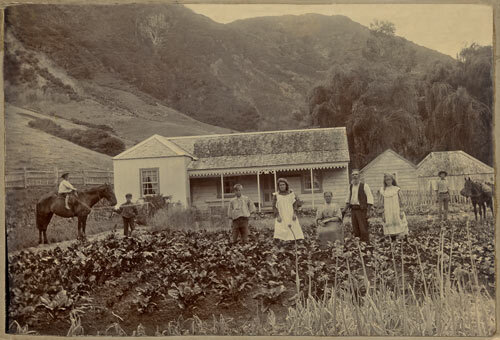 During the 1850s and 1860s many English migrants came to New Zealand assisted by provincial governments, while others paid their own way to join the gold rushes. Two who came in these years were Edward Paddison, a railway worker from Lincolnshire, who was drawn to New Zealand in 1859 by an advertisement for copper-mine workers on Great Barrier Island, and Annie-Marie Cooper, who arrived from Staffordshire with her parents in 1864. They later met and married, acquired property on Great Barrier Island, built a house from pit-sawn timber, and raised 10 children. Here, the couple and some of their children pose in front of their home in 1898.